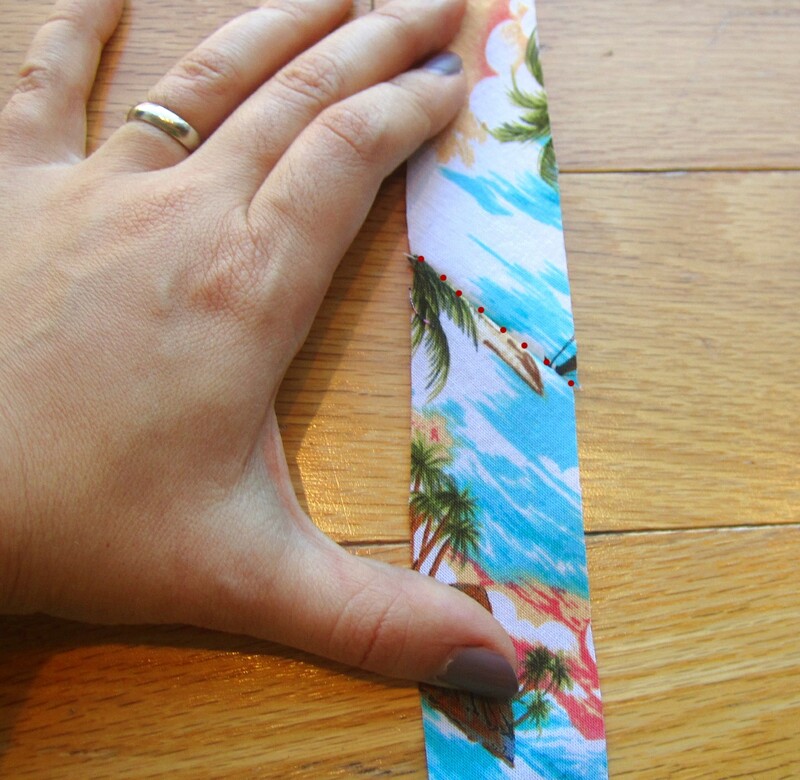 Making your own bias binding tape is such a great idea. You can use up old fabric scraps, saving money, and your handmade binding tape can be soooooooo much prettier than anything you can find in fabric shops. 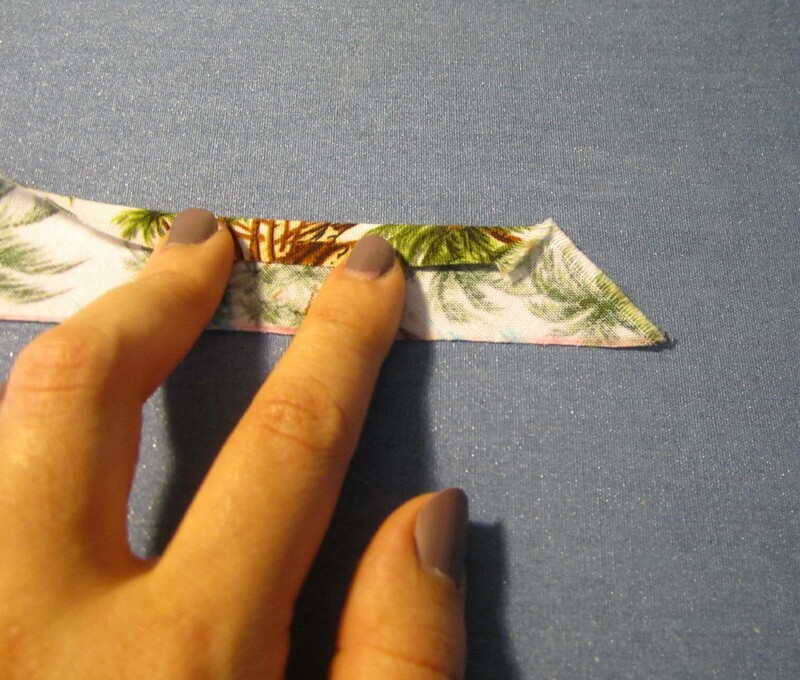 This tutorial will show you how to make a special single fold bias binding tape. I find that so many projects have you pressing open one of the folds of your bias tape, which leaves messy leftover creases, so why not make exactly what I need for my project? The picture below shows that there is exactly one fold in my binding tape, which is exactly one fold less than what you’ll find in single fold bias tape. I don’t really know what to call this method; Half-Single Fold? Quarter-fold? Super Special Fold? Fabric options: you want cotton. Shirting weight cotton, or quilting cotton (which are pretty much identical twins who sometimes pretend to be each other in order to go out on sneaky dates and help each other pass tests; if you aren’t familiar with the Wakefield twins then please disregard most of this parenthetical blather). You want a chunk of fabric that’s a decent size. We’re cutting on the bias here, and little scraps will be too fiddly. 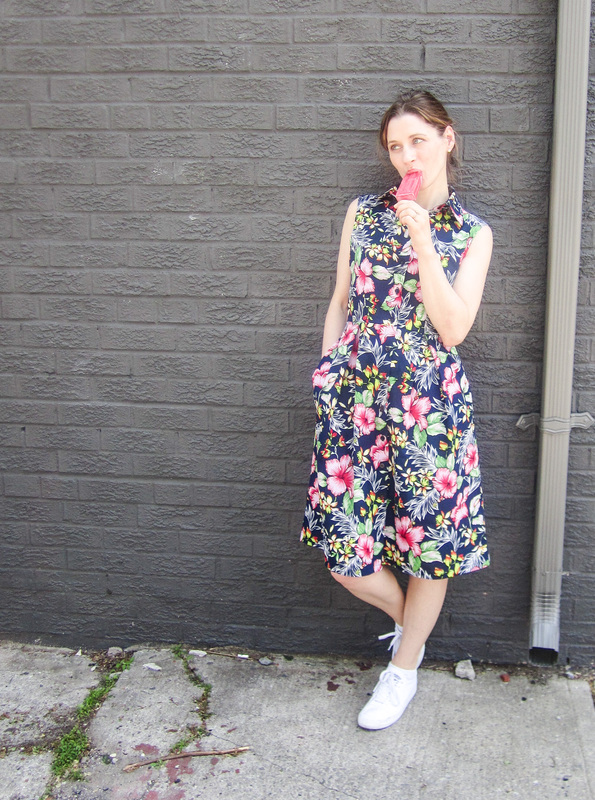 So get a scrap of fabric that’s no smaller than 12″ x 12″ and you should be good to go! Lay your fabric wrong side up on a flat work surface. 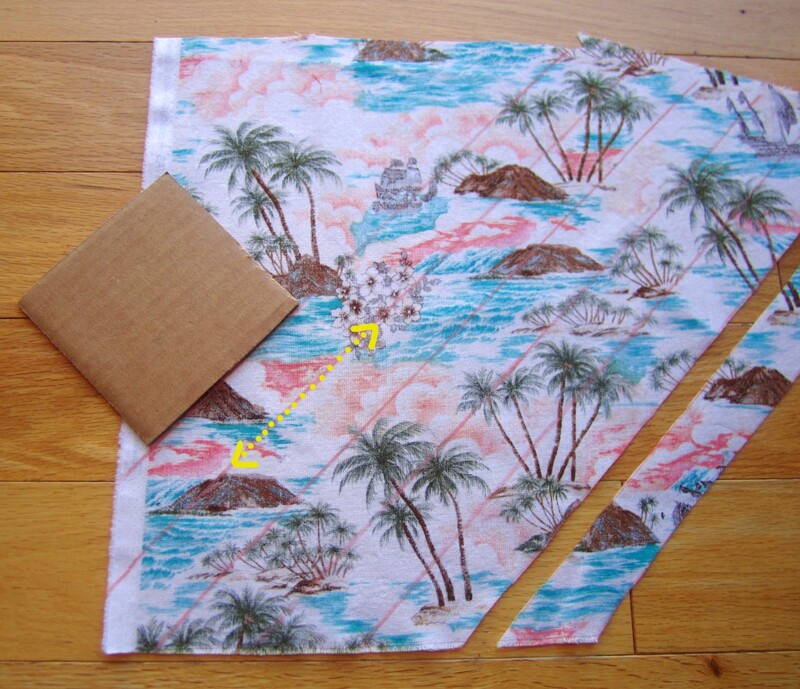 You want to establish a 45° angle to cut your bias binding tape. A 45° angle will give your binding tape the most stretch, which will allow it to hug the curves of your neckline and armholes without bunching up. If you have a quilter’s ruler that includes a 45° angle line, then you won’t have any trouble finding and marking your bias. You can also find a printable option online (like this one, or this one). Get a piece of cardboard or bristol board and cut a square, 3″ x 3″, 4″ x 4″, whatever size you want, as long as it’s square. Lay that square on your fabric so that two opposite corners of the square meet up perfectly with your fabric’s selvage, or grainline. 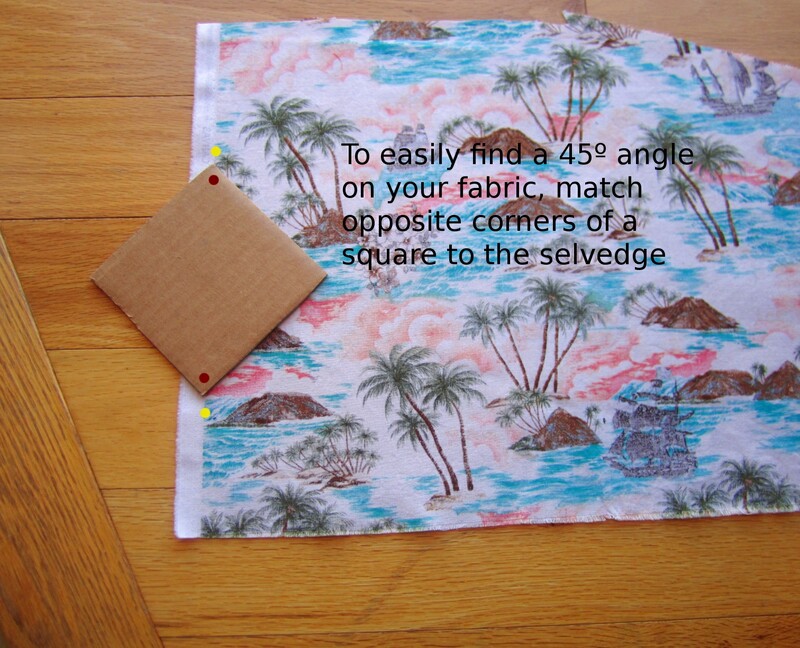 The sides of your square are now both making 45° angles along your fabric. Mark that line with tailor’s chalk. 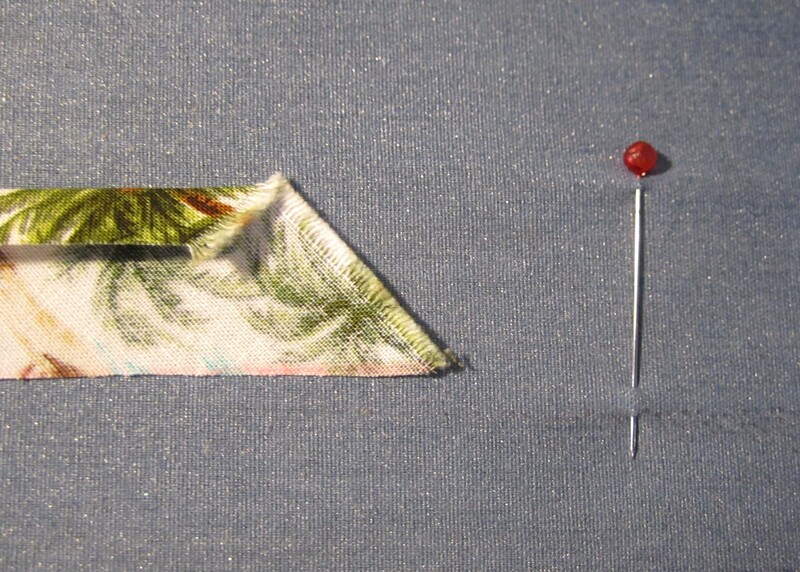 Use a ruler to extend that line all the way across the fabric. Mark several bias lines along the fabric, with a 1″ width. Cut along those lines until you have enough strips for your project. Take a strip, turn it right side up and, with right sides facing, lay another strip across it perpendicular (that’s “+” shape, not a “=” shape). 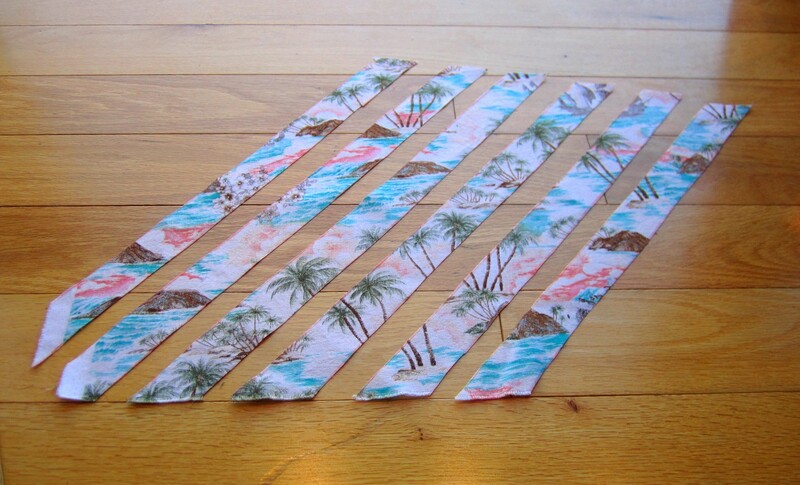 Just the edges of each strip are laying across each other; you don’t want to waste a bunch of fabric! Sew diagonally across the strips, starting in one corner where the two strips intersect, and ending in the opposite corner where the two strips intersect. This will make your binding tape smooth and even. Trim the excess, leaving 1/4″ seam allowance. 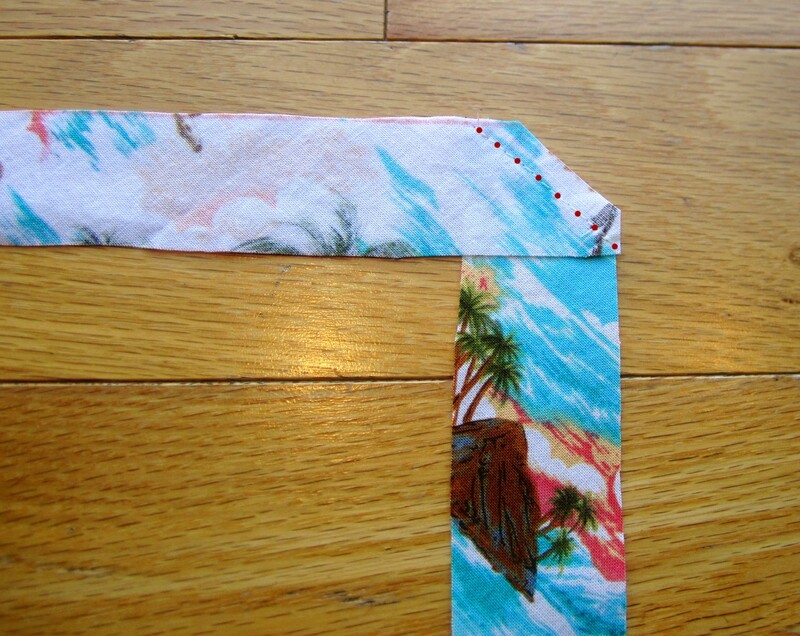 If your stitch line was accurate, the edge of your binding tape should look smooth and even like it’s one long strip. 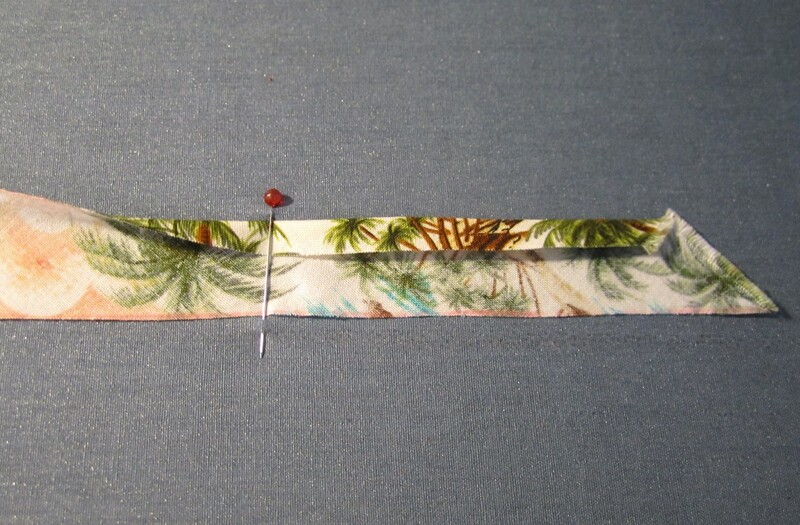 Continue sewing your strips together and trimming the excess seam allowance. 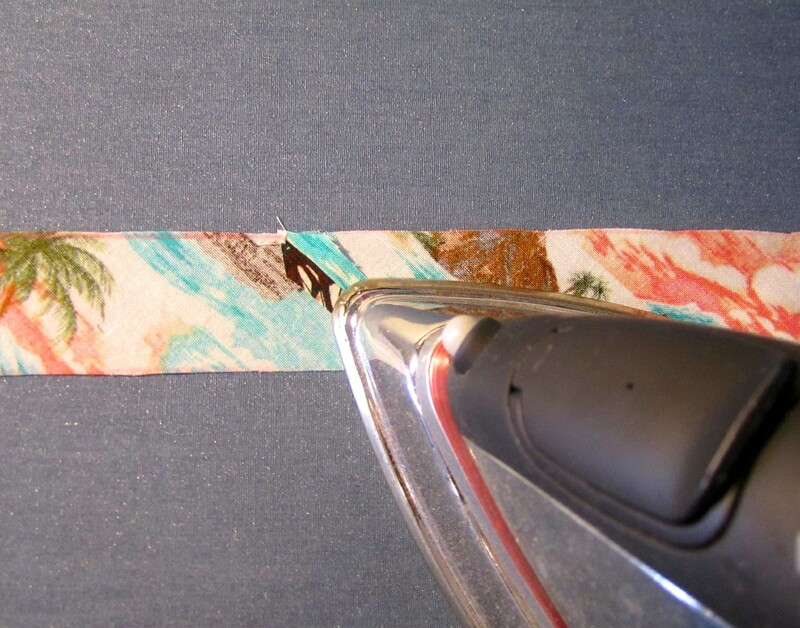 Once you have one long strip of binding tape, press all of the seams open. Now it’s time for a fancy trick! I learned this trick from this tip on the Colette website. I’ve had traumatic experiences with bias tape makers in the past, and I find that this pin trick is way easier to manage when you only have two hands. 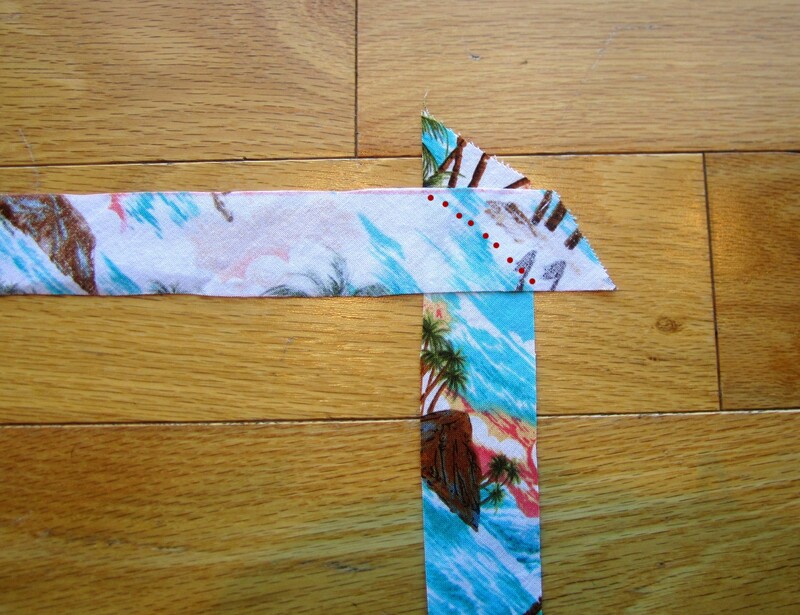 Take your fabric strip and fold over the top third. 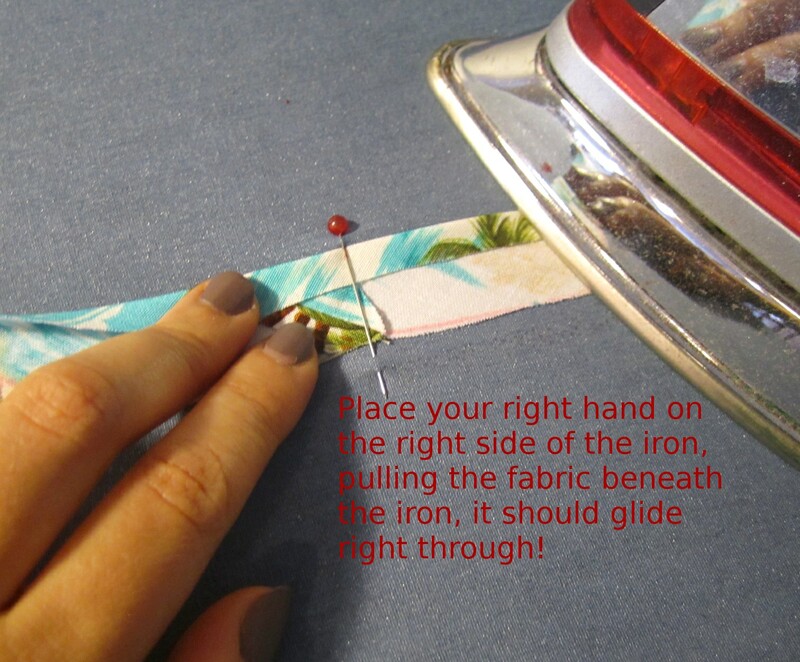 Stick a pin into your ironing board (consult following picture), so that there’s just enough width for the folded fabric strip to pass under the pin. And press is with a hot iron when it comes out the other side. Keep sliding and pressing the fabric strip until you’ve reached the end. You might have to fiddle a bit with the strip when the seams are passing under the pin, otherwise it’s pretty smooth work! 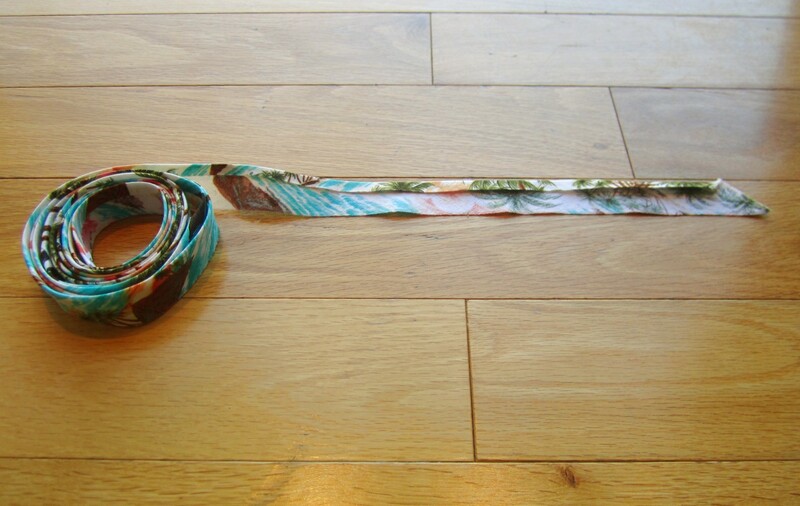 Once you’ve finished pressing your strip, coil it up and save it for your sewing projects!